Lok Sabha 2019: The Prospects of NDA in the Hindi-heartland. Part 2: Madhya Pradesh, Chhattisgarh, Jharkhand. The first part of this series focused on Bihar. The five part series will talk about NDA prospects in different states, culminating with Uttar Pradesh. In 2014, BJP recorded its best performance in MP by winning 27 of the 29 Lok Sabha seats with a vote share of 54%. Only 3 months back, the 41% vote share brought the BJP’s seat tally down to 109 from 165 of 2008. Congress's vote share was almost equal to the BJP’s vote share. Will it have an impact on the 2019 LS polls? A simple extrapolation of 2018 results, Congress took the lead in 11 LS seats that give a tally of 18 to the BJP a net loss of 9 seats compared to 2014 and statistically, the likelihood of the BJP retaining its 2014 number in 2019 has a low probability. However, the Congress party returned to power in the State after a break of 15 years, riding on candidate level anti-incumbency and a lot of voters chose NOTA. In MP, 72% of voters live in villages. The massive crash in rates of agricultural commodities in the past five years had angered the farmers. However, despite these farmers expressed their resentment about reduced rates for produce and the debt trap, the target of their ire was not Mr. Modi. It is interesting to note that after 1984, 11 seats in 2009 was Congress's best performance. Even when Congress was in power in MP, the BJP did much better in the LS elections of 1996, 1998 and 1999. The Congress party's leadership mostly include Rajputs and Brahmins, while the BJP has a long line of backward caste leaders including - Babulal Gaur, Uma Bharati, and Shivraj Singh Chouhan - to consolidate the Hindu votes. In all probability, 2019 turns out to be yet another “wave-election," and a comparison of assembly and LS elections could be extremely hazardous in a state where Narendra Modi is a massive factor. Congress is trying its best that the BJP’s plans to make it a referendum on Mr. Modi and his narrative on nationalism and national security is diluted, and a Congress's pro-farmer, pro-poor narrative is built upon its NYAY scheme. Curiously, the 100 days old Congress government in the State, faces flak for its betrayal of loan waiver, which the party had promised during the election. After the colossal cash being seized in the IT-Raids from the close aide of CM Kamalnath's premises, Congress has exposed itself completely. Congress veteran Digvijaya Singh’s entry into the fray from Bhopal has opened up the possibility of a fierce contest, but it still is a predictable seat. This city has not sent a Congress member to the Lok Sabha since 1984. Rumors are that Sadhvi Pragya, acquitted in the Malegaon Blast case, is interested in contesting against Saffron-Terror perpetrator Singh from Bhopal on BJP seat. That would further polarize the state. Realistically, in MP BJP is facing a tough fight only on 4-5 seats including Gwalior, Guna, Ratlam, Dhar, and Chhindwara. BJP is likely to secure more than 50% vote share comfortably. Prediction: BJP - 24-25 seats. Congress - 4-5 Seats. In 2019 LS elections, the ruling Congress in Chhattisgarh faces its first big electoral test after sweeping to power in the state that left the BJP scrambling for existence in a state, it dominated for 15 years. BJP, which won 10 of the 11 LS seats in 2014, has a tough road ahead. Whereas, hoping that the voter mood in the assembly polls will also reflect in LS polls, Congress Party is looking to take its tally up from 1 seat. The forthcoming polls in Chhattisgarh would be bipolar having the former CM and Chhattisgarh Janata Congress (CJC) chief Ajit Jogi withdrawn his party from the contest. However, his alliance partner Mayawati (BSP) has announced six candidates without consulting him. It would be interesting to see if Jogi campaigns for BSP or leaves his loyal Satnami voters to decide for themselves. Congress anticipates an affirmative vote based on the fulfillment of poll promises by the Bhupesh Baghel government during its 3-month stint and hopes that the election will revolve around the rise of MSP of paddy and farmers’ and tribal welfare policies formed by the newly formed Congress government. Congress is also highlighting the return of tribal land which was acquired by Tata in tribal dominated areas. The State government’s decision of loan waiver for farmers may also reap some dividends for Congress party in the State with 77% rural population. On the other hand, BJP is banking on the policies of the central government and the Modi factor. BJP is still burdened with the local leader's anti-incumbency factor. 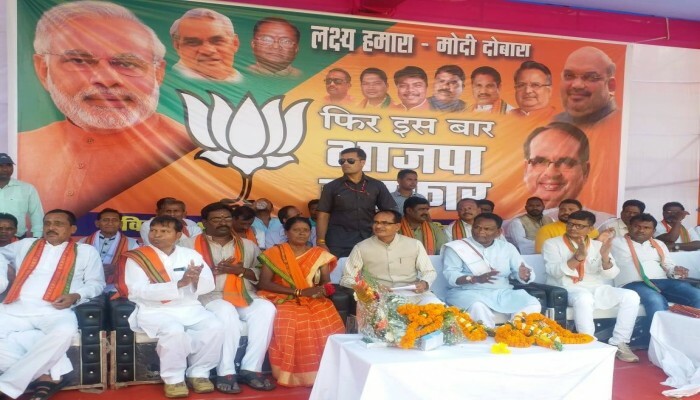 To counter that, it has done a complete political rejig and has fielded less-experienced faces from all the seats replacing many stalwarts - 3 time CM Raman Singh, MP Vishnudeo Sai, eight-time MP Ramesh Bais, State chief Vikram Usendi and the party secretary Saudan Singh. The BJP is flashing its trump card of national security and its success in reducing the enduring conflict with the Maoists. The BJP is still strong in the urban areas of Raipur, Durg-Bhilai, Raigarh, and Bilaspur. The latest developments from the neighboring erstwhile parent state MP, of huge cash seizure from CM's aide's premises and also the murder of the BJP MLA by Naxals, rings some hope for BJP in rural areas too. Ultimately the OBC's who constitute about 54% of the state’s population and had backed the BJP in the past and voted decisively for Mr. Modi in 2014 will decide the fate of the two parties, who are likely to vote in-block. Prediction: BJP - 5-6 Seats, Congress - 5-6 seats. One state to watch out is Jharkhand. Jharkhand has 14 seats and all the parties are working hard in the state to grab as many seats as possible. Congress, which is in an alliance with Jharkhand Mukti Morcha (JMM) - 4 seats, Jharkhand Vikas Morcha (Prajatantrik) - 2 seats, and Rashtriya Janata Dal - 1seat, will contest on 7 seats. However, it is interesting that despite this agreement, RJD has also fielded its candidate from Chatra that was allotted to Congress. Let us see who withdraws its candidate or both alliance partners contest. Sunil Soren, meanwhile, has been challenging JMM patriarch Shibu Soren from his pocket borough Dumka. JMM should win both ST reserved constituencies Dumka and Rajmahal from the Santhal Pargana division. However, my eyes are on Dumka, and the result can shock many. BJP has fielded most of its sitting parliamentarians, barring seven-term MP from Khunti, Kariya Munda, replaced by former chief minister Arjun Munda. An excellent move. BJP has also dropped sitting MPs Ramtahal Choudhary (Ranchi), and Ravindra Rai (Koderma) to try new faces Sanjay Seth and Annapurna Devi Yadav. BJP is in alliance with All- Jharkhand Student’s Union (AJSU) and parted with the Giridih, a strong BJP bastion. This could be a gift to UPA unless the BJP cadre strongly back their alliance partner. It is true that Congress has worked hard and have quietly gained the ground a little riding on local anti-incumbency. But as the so-called journalists and psephologists are suggesting, quoting their 'ground report' that BJP is losing Jharkhand, is nowhere near reality. Most of the pollsters are giving one seat to JVM-P. I don’t know which one. Jamshedpur is a BJP seat and whoever contests will win. The next which the Party patriarch Babu Lal Marandi is contesting is Kodarma, who came 3rd behind communists in 2014. The issue with Kodarma is that the ex-BJP State President Ravinder Rai has been denied ticket and given to a four-time MLA from Kodarma, Annapurna Devi which she won on RJD ticket and recently joined BJP. BJP's 2014 victory both in parliamentary as well as assembly elections in Jharkhand was before Ujjwala, Toilets, and Electrification. The tribal movement towards BJP is clearly visible on the ground. Under the "अंधेरे से उजाले की ओर" (from Dark to Light) program, many villages in Jharkhand that were affected by Naxalism is today provided electricity by CRPF. Students can study, and women can cook. CRPF even reads the daily newspaper for them. These are the driving force for voters of Jharkhand. A rise in UPA vote share is likely, and the margins may not be the same like 2014 averaging above one lakh vote, but saying that it will trounce BJP in Jharkhand, which is entirely Modified, is beyond imagination. Seat Projection: BJP-9, Cong -1, JMM-1, Close contest (Dumka, Kodarma, and Giridih) – 3.